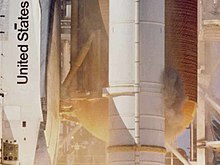 ^ Shuttle Solid Rocket Booster Facts. NASA. （原始内容存档于2008-02-19）. ^ Salt Water Activated Release for the SRB Main Parachutes (SWAR). NASA. 2002-04-07. ^ Report of the Presidential Commission on the Space Shuttle Challenger Accident, Chapter IV: The Cause of the Accident. NASA. ^ Space Shuttle Challenger Case. ^ Orbiter Manufacturing and Assembly. NASA.